The second annual Student Technology Conference is a week from tomorrow! This is a free one-day online event bringing together students, educators and innovators from around the world, will be held Saturday, January 30, 2016 from 9 Am to 9 Pm EST. Anyone can attend. Deadline to Submit Presentations: the deadline to submit presentation proposals is end-of-day Monday, January 25th. There's still time to get a proposal in and to present! Presenters with Accepted Proposals: It is important that you join the presenters group HERE and that you have scheduled your presentation time. Information on scheduling your presentation time was sent to you by email. If you cannot find that email, please contact Lucy Gray HERE. You must also watch the recording of or participate in a training session so that you know how the conference platform works, how to upload your slides, and make sure your computer, microphone, and webcam (optional) work in the system. Information on the training is HERE. Presenters with Proposals Not Accepted Yet: You should also make sure you have joined the presenters group and that you have prepared by taking or attending a training. Any proposals not yet accepted have had notes added to them indicating what you would need to change or improve in order to have your proposal accepted, and those changes need to be made by Monday, the 25th as well, to be re-considered. We hope you will update them and be prepared to present! Everyone Else (Those Not Presenting or Volunteering): Get ready for a GREAT conference. Keynote speakers are being announced this weekend, and mid-next week we'll post and email the full schedule of speakers. 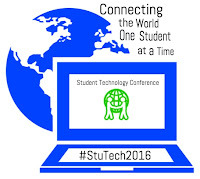 Be sure to join the conference network at http://www.studenttechnologyconference.com, follow the Tweets at #stutech2016, and let everyone you can know about this free event organized by students.